Man, looking back at the picture of the pickup, I miss the watermelon. Between me and the kid, our half of the watermelon was gone within days. I need to get out to the farmer’s markets and see if I can find more. 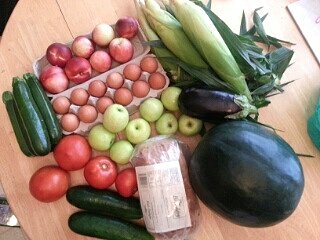 Week 10 of Breezy Willow’s summer CSA: zucchini, tomatoes, cucumbers, Summer Gold apples, an eggplant, a sugar baby watermelon, six ears of corn, nectarines, eggs, and bread (Breadery plain white). I love that the sugar baby watermelon had seeds in it. I used to get seeded watermelon all the time as a kid, but it feels like I hardly see them in grocery stores anymore. Now it’s all seedless. I’ve always found seedless watermelons bland and depressingly monotonous compared to seeded ones. Sure, they’re more convenient to prepare, but on the other hand, the best and sweetest flesh is always next to the seeds, and you also get the pleasure of spitting the seeds out into growing piles. 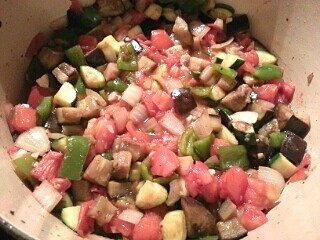 Anyway, I saw the eggplant, zucchini, and tomato, and I just had to make ratatouille. Apparently my favorite time to cook is now Friday nights. After the kid goes down for the night, I still feel like I can stay up, chopping and stirring and simmering, and not have to worry about getting stuff done for the next day. I made this beautiful colorful mess of vegetables on Friday night, using Melissa d’Arabian’s recipe. I spread it out to cool in a pan, then poured it into a plastic container to chill in the fridge. Easy vegetable reheating for the rest of the week! It’s chunky, too, so it can be finger food. Hopefully the kid will take to it as well. It’s gorgeous in Maryland right now. July slammed us with heat, humidity, and tons of rain (I feel like the lawn just keeps getting taller no matter how often it’s mowed). It seemed like summer was going to be nasty, but so far August has been quite gentle with us. I hope the mild weather continues. 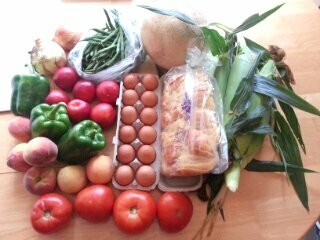 Week 9 at the CSA: onions, green beans, cantaloupe, green peppers, nectarines, peaches, tomatoes, corn, eggs, and bread (Great Harvest challah). The cantaloupe felt ripe, smelled sweet, and was terrifically juicy when I cut into it. However, the flavor was just bland. It was disappointing because I had the same problem with another CSA cantaloupe from an earlier week. I think the rainy season has plumped up the cantaloupes but left them a little lacking in the flavor aspect. Or maybe I’ve just been unlucky with cantaloupes. I love a good fresh cantaloupe, but if they keep going like this I’ll have to consider making them into agua frescas or something. If we hadn’t just bought a third of a cow (more on that later), I’d think about making cantaloupe popsicles. 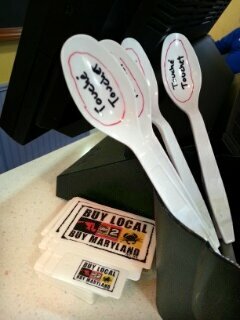 I’m all for buying local! Apparently this card gets you discounts at local vendors (10% off your Touché Touchet purchase, for starters). However, when I visited the website, I was disappointed that there were only two Howard County “Food and Dining” participants, namely Touché Touchet and Chen Hibachi. Come on, Howard County, you’re crammed with food and dining options; get with the program. Also, the website is annoying and clunky to navigate; you can view participating vendors by category, but can’t search by location. It gets difficult to “buy local” when you can’t even define your locality. I think this little card I picked up is going to be pretty useless to me until a) more Howard County vendors participate, and b) the website gets a facelift.